Dear art connoisseurs, here’s my latest offering for your visual delectation. 20th century art fans will recognize the influence of Bacon in the left half, and because of this proximity, the right side smacks of Chuck Close, Cindy Sherman, or Gerhardt Richter. But probably I’m the only one who has done anything quite like this. For this post I’m going to include lots of pics — even more than usual — to elucidate a bit more about my process and what goes into making something like this. This was when I was in my 30’s, so it’s about 15 or so years old. This was when I lived in Brooklyn, had my full-time job, apartment, and all that. If you are one of the few people who’ve followed this series since the beginning, you already know one of the big ironies of me doing work around selfies is that up until I started this piece, there are very few pics of me. I’m also well known for ruining pics by making faces. I don’t like being photographed, and when selfie-sticks came out, I was sure they were a joke. I couldn’t imagine people being comfortable being so vein in public. Lots of times the AI gives crappy results, but this one was good. I knew I could work with it. Some other pieces required a lot more fixing. Rarely does it do hair well, and usually I have to do a lot of inventing and importing hair from images I cull from the Internet (which is much harder than it sounds to do persuasively). Her ears are weird, and her left eye is off, but it looks convincing. In this case I wasn’t going to need to change the head much. It’s not just a matter of blowing up the image, or doing photo-editing. The quality is abominable. 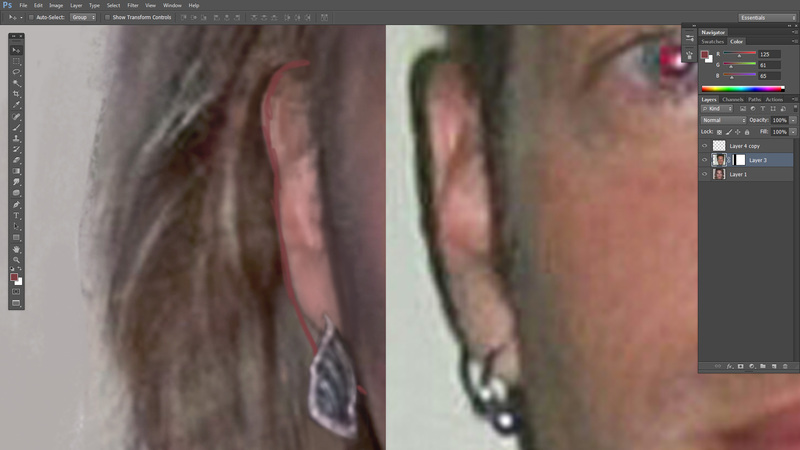 Below I was trying to figure out what the hell was going on with the ears by comparing the altered image to the original. Because the picture was taken with flash, the ears are illumined peculiarly, and are light in areas where one would customarily shade them. 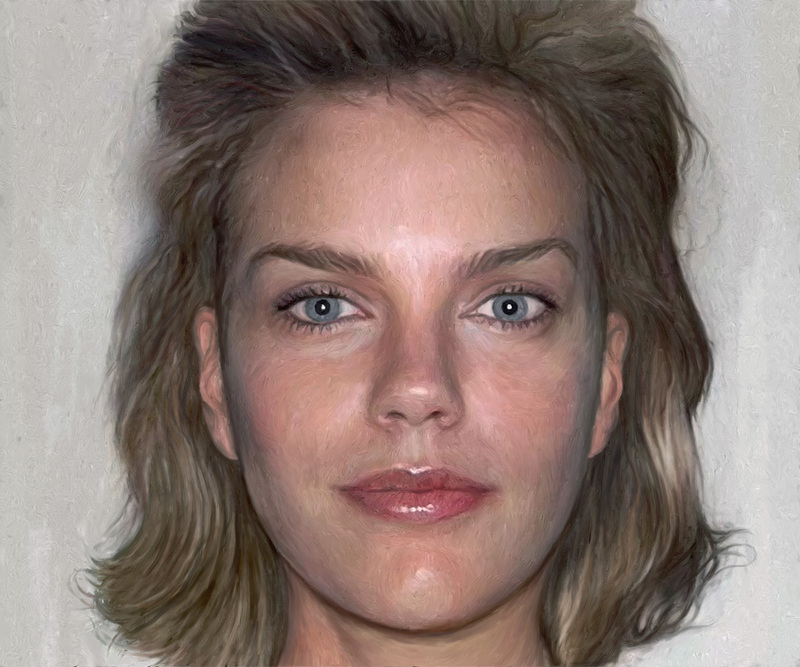 This Baconesque painterly abomination accompanies the girl, as if an Expressionist figurative artist painted her this way, or her in some state of startled transmogrification (when you consider the series as a whole, there’s a quality of one person being shuttled through all these different identities, hence “Selfies From Alternate Universes). This is the first in the series where I just make up one side of a diptych. I’ve been planning to do so, with some of them, for a while. I’m guessing a lot of people are going to like one or the other side a lot more. I used different (digital) painting styles for each side. Some people have been wanting me to do different races. Be patient. I have some of those coming. They are harder to do, though, because the App which allowed one to experiment with changing race was SHUT DOWN as “racist’ by our good social justice warriors who protect us from such terrible things as envisioning ourselves as different people of different races. I didn’t discover there ever was such an App until after it was killed in the name of progress. I’ve still managed to do one so far, and I have other ways of doing it. There are at least six I’m planning on doing. More may crop up. All sorts of surprises are on the way. Posted in art, Selfies From Alternate UniversesTagged art, contemporary art, digital art, figurative art, modern art, painting, portraitBookmark the permalink. Well! Young Eric! You still had crazy hair. 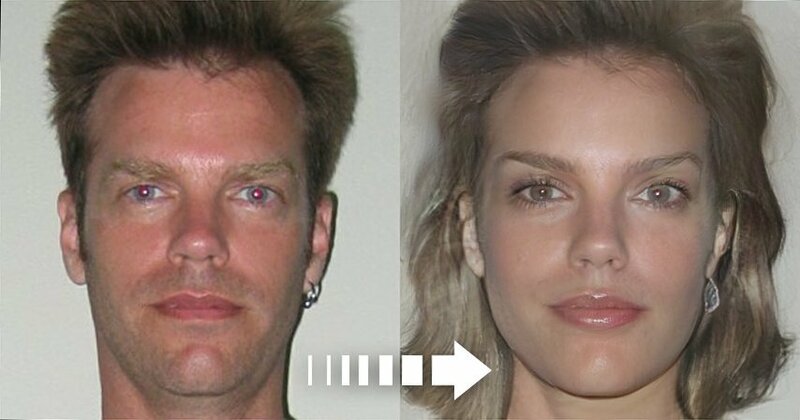 The Face App did a good job of making you a pretty girl. 555. She looks great. She crops up several times. Some of the people repeat, and she’s one of ’em. These are fascinating Eric! I can’t imagine how you must feel looking at all these. I would think it would feel as if one didn’t matter in the least. That we are all just a random assortment of DNA and could be scrambled up one way or another and who we are is just chance and not environment, hard work etc.. A house of cards waiting to tumble. But it’s also liberating to think that way as well. That we are all bits of stardust that has the power to reassemble into something new and beautiful. Hi “someone”, whoever you are. First, thanks for reading, commenting, and especially taking the time to look at the series with an open mind. Your insight is especially valuable because it lets me know that the work is causing people to think about the nature of identity, circumstances, and so on (age, gender, race, economic status, era…). It’s an interesting conclusions to come to. I do believe strongly in free will, and that we can make of ourselves what we want, to a degree, with a bit of luck and opportunity. Even so, even if we get to play the deck we are dealt, we don’t get to choose the cards were are dealt. And, of course, we don’t get to choose the nature of the universe we are born into, or the configuration of our own species, etc…. The liberating element is perhaps allowing the imagination to bleed into different plausible lives. I often think of how my life would be different if I’d made this or that different choice. And because I’m an expat whose lives in 4 countries in Asia, I could quite easily be in another country entirely, or back home. As another blogger pointed out, just one chromosome different and life would be completely altered. Mostly, when looking at these, I think about the struggles each person would likely have gone through. I wonder what it would be like to be that person…. Wow. 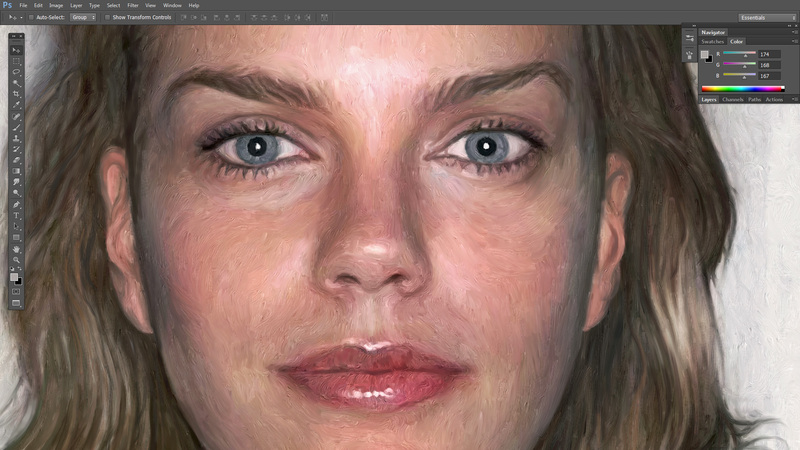 I’m always fascinated by the zooms that show the brush-stroke effects you achieve. The Baconesque one has great appeal for me. I’m drawn to distortions of faces. Your series is rich in these. Thanks! I really appreciate the people who have followed this series. And there should be more facial distortions coming, in fact the next piece which is in progress. Also, as far as I know, nobody else has ever achieved a digital Bacon style. Next one might be a little different though, not so Bacon, but similar technique. I don’t typically get super excited for your pretty women, but this one is really cool! She gives out 80s vibes. It’s also great that you walked us through the process. Those zoom ins on the impasto take it to a whole new level. Someone else mentioned the 80’s on IG. I see it, too. I think it’s the swept-up hair. And it’s quite odd that she looks like she’s from the 80’s. I graduated HS in 83, so, I would have been in my 20’s in the 80’s, and she looks like she’s in her 20’s, but the picture was taken no earlier than 2,000. I just happened on a new impasto technique that allows greater detail. I’ll be exploring that some more.